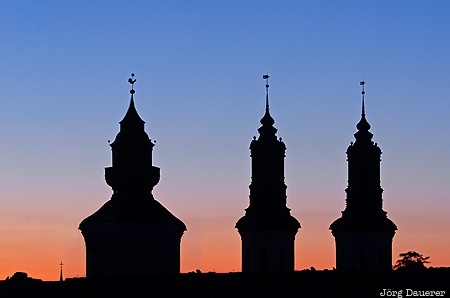 The silhouettes of the towers of Visby Cathedral (Swedish: Visby Domkyrka) in front of a colorful sunset. Visby is the capital of the island Gotland in the Baltic Sea in the south of Sweden. This photo was taken in the evening of a cloudy day in September of 2014. This photo was taken with a digital camera.